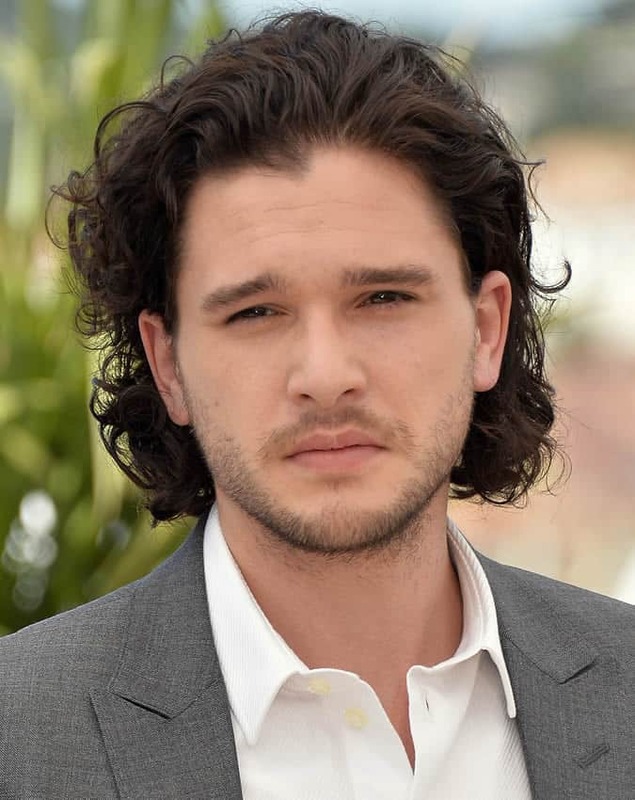 Has there been a character in TV history that has ignited more hair envy and lust than the luscious locks of Game Of Throne’s Jon Snow, aka Brit actor Kit Harrington? There’s Joe Keery’s big hair in Stranger Things or that Peaky Blinders haircut. But did either of those styles have their own contract prohibiting the wearer from letting a hair out of place? Harrington’s did, and while the A-lister has sneakily made slight variations on the cut for other roles he’s always had to return to that bouncy, curly Jon Snow haircut when returning to Game Of Thrones. Now, his watch is ending and with talk of the actor eagerly awaiting a contract-ending shear, that leaves a space in the universe for someone to take the curly hair mantle. Could it be you? If you’re up to the challenge we’ve asked top barber Dan Smith from Ruffians in Edinburgh on how you to get Kit Harrington’s best haircuts. If you know nothing, this is a good place to start. With his facial hair a little bit shorter than it became in his later seasons as Jon Snow, Harrington lets the hair do all the talking here, the stubble easier to pair with his messy mane. “His hair has a lot of weight to it that frames his softer features and highlights his dark eyes,” says Smith. “It’s a classic blunt cut mid length, which basically means there are no hard corners and it’s the same length all over. A blunt cut will seal the ends preventing split ends. And from a more boyish style by Harrington, we go into a slicked back style best described as super-suave Italianate pondering the best place to grab an espresso while he waits for the next Pitti fashion show. Smith agrees, somewhat: “By pushing long hair back behind the ears you can create more of a sleek look. Kit’s beard has also been brought in tighter, making him look more refined. Get your barber to keep most of the length and just trim the ends so that the hair sits perfectly behind the ear. With just a smidge taken from the length of his usual Jon Snow haircut, and Harrington’s lighter natural hair colour coming through, this style is less “winter is coming” and more “summer is here”. “His hair looks healthier and his skin tone more radiant,” notes Smith. “To get it ask for a point cut with uniform layers to remove some weight so the hair is not too weighty on the sides and back. This will also create a nice flowing movement so it’s easier to maintain for longer and the wait between haircuts can be longer. 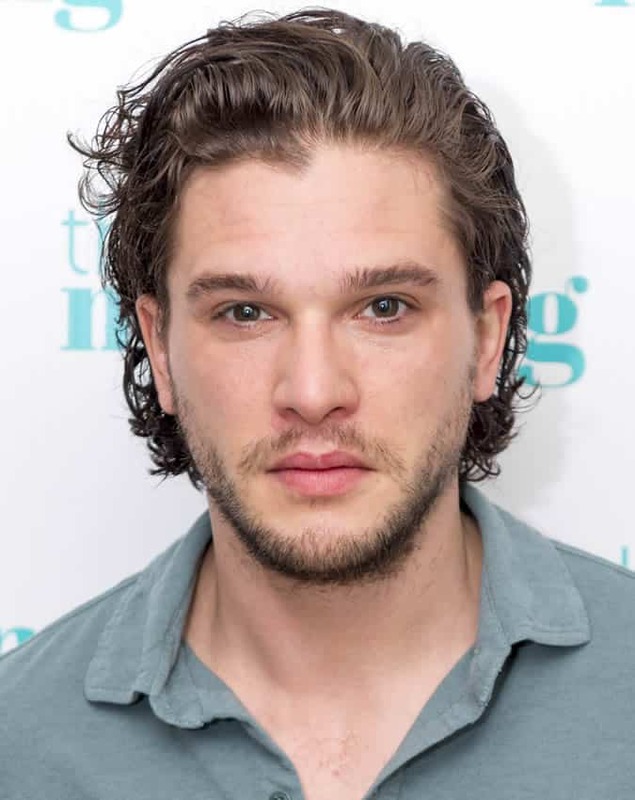 Kit Harrington’s hair doesn’t just grow back after chopping. It would take a year to a year and a half to get from short to the length he has it as Jon Snow. So if you have an interview or big red carpet event and want to look more clean-cut for it you’re going to have to get creative as Harrington has done here. It’s not quite a top knot like he had on the show, but it’s not far off. “Firstly, you need to make sure the hair is long enough to be able to tie up,” says Smith. “Then ask for only a centimetre or two off the ends to keep your locks healthy and happy, whilst also making sure that there’s still enough hair. This look is peak Jon Snow. Long hair usually works best when the wearer is clean shaven, or else there is just too much hair. Harrington gets away with it by sweeping his up and out of his face which also serves to add height and elongate his rounder features. Smith says to get Snow’s cut you need to be asking your barber for a razor cut to create movement while taking weight out of the heavy curly hair. “Also have your beard tidied under the neck and on the cheeks, leave a little length under the chin to allow for a denser look. Towel dry to 80 per cent and apply a sea salt spray. Use your hands to scrunch the product in accentuating the curls and creating a nice textured effect. For his role on the West End as up-tight screenwriter Austin in True West, Harrington needed a look that replaced the debonair warrior for something more particular. “Having a pushed back, medium-length style helps to create a more refined, polished look whilst still embracing Kit’s curls,” says Smith. “Make sure to ask your barber to keep the length a little longer on top so that it’s easy to push back. Elsewhere, the ‘tache has made a comeback of sorts, with Hollywood stars Henry Cavill and Zac Efron showing how to update the 70s heirloom. This look was meant to be going after that retro vibe for his play but we’d recommend taking after Cavill and Efron and growing some stubble on the sides to balance out the look and make the facial fuzz look less drawn on. 10 What Is A Tachymeter Watch And How Do You Use It?